I got an email asking me ifweight was so important, why not the X-T2? Fair question. There are several things that allow us to make technically wonderful images; First the image should be sharp, this is accomplished several ways, quality and contrast of the light, sharpness of the lens ad lens focus, and finally the elimination of camera movement during exposure. The photographer has to find the best light, make sure focus is accurate on the intended subject, and use only the best glass! In order to prevent camera movement during the exposure we usually rely on a good solid tripod, however there are times when we can’t use a tripod or woukd miss the shot while setting it up, that is where the X-H1 woukd be most valuable! If the upcoming X-T3 had IBIS, then of course I would pick that body, but it appears that will not be the case and if it did, it would be larger anyway. All these selections support the needed conditions above! Where is the 18-135 zoom? Not in this kit, but it is in my backpack with my larger car system! I’ve thought about this, too, and I think – particularly with the use of the X-H1 – that I’d go with the 16-55 and the 55-200. The 16-55 is a 2.8, and that’s usually fast enough; it covers the range of the 23, 35, and 50, so 3 lenses are eliminated by one lens. I might add the 14, although you only get 3mm difference (21 vs 24). The IBIS system would make the two shorter lens totally usable, and this would be a small, lightweight kit that would cover just about everything. [Fuji should consider adding a 10 mm f/2 to their f/2 lineup – that would provide a truly wide angle lens to the kit.] I did London, England, in 2014 with the X-T1, the 14, the 18-55, and the 55-200 and never felt the need for any other lenses. Of course, any speculation like this would not account for running into a subject that called for a macro lens, so maybe I’d have to take along the 60mm (the 80mm is too heavy). I’ve thought about this, too, and I think – particularly with the use of the X-H1 – that I’d go with the 16-55 and the 55-200. The 16-55 is a 2.8, and that’s usually fast enough; it covers the range of the 23, 35, and 50, so 3 lenses are eliminated by one lens. I might add the 14, although you only get 3mm difference (21 vs 24). The IBIS system would make the two shorter lenses totally usable, and this would be a small, lightweight kit that would cover just about everything. [Fuji should consider adding a 10 mm f/2 to their f/2 lineup – that would provide a truly wide angle lens to the kit.] I did London, England, in 2014 with the X-T1, the 14, the 18-55, and the 55-200 and never felt the need for any other lenses. Of course, any speculation like this would not account for running into a subject that called for a macro lens, so maybe I’d have to take along the 60mm (the 80mm is too heavy). All very good points. If I owned the 16-55 it would certainly have been consiered fro the middle range. If weight were not a factor, I would do the 10-24, 16-55 (which I don’t own, did, but sold it, but do have the 18-55 and love it! ), and the 55-200. We could do this all day long, but all are valid and thoughts worth considering. Hope your bride is doing good, we all really love her! The 1.4 TC on the 80 will give me the 112 so fairly well covered there. Would love to have the $6,000 200 f/2 with a 2x TC on it – a 400 f/4 would be fun. Bill good discussion. 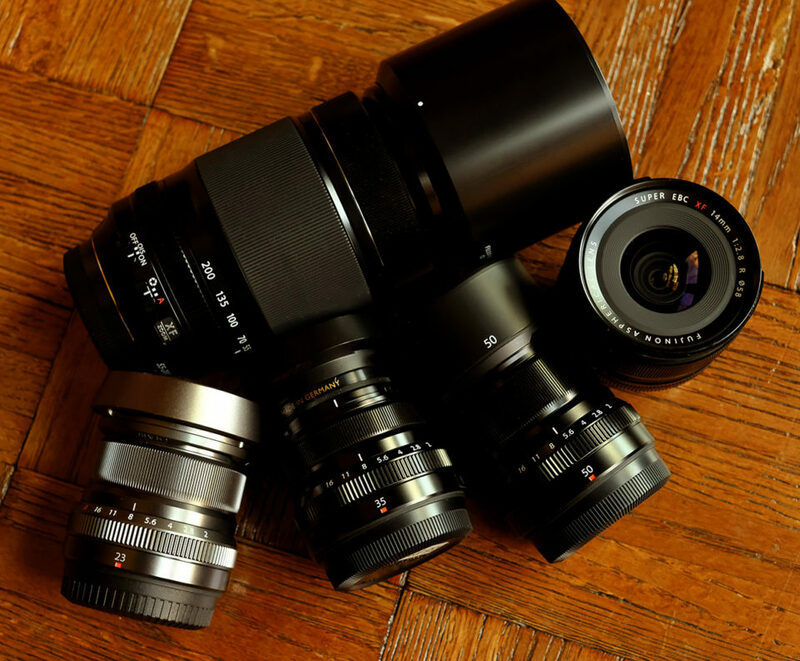 the four primes in your set are my go to lenses of choice. I supplement on the wide end wth the Rokinon 12mm and on the long end with the 90mm f2. If i need longer it is the 55 to 200, which is very versatile. Going to Italy for two weeks this fall and I will be taking your set sans X-H1.